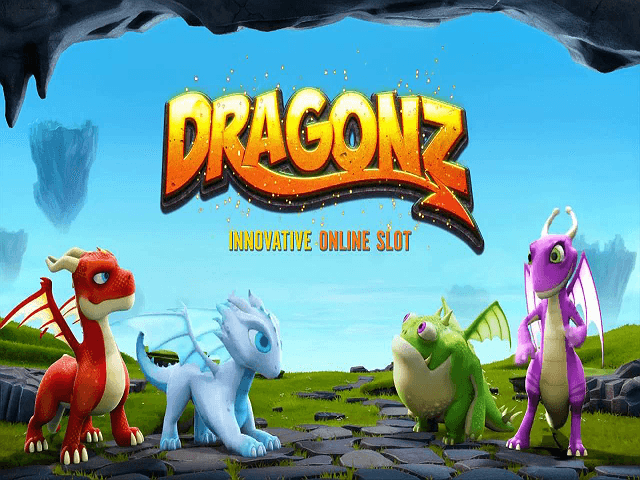 Welcome to the world of Dragonz, a colourful online slot game from the creative gurus at Microgaming. 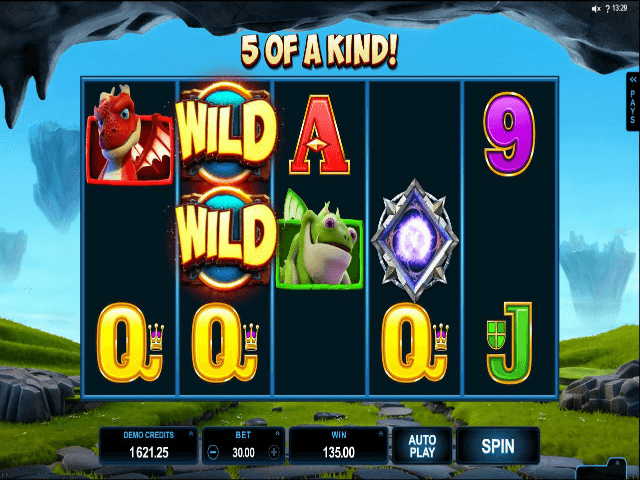 Dragonz slot game stars four cartoon-style Dragonz: Flint, Switch, Frost, and Gobble, spread across five reels with 243 ways to win. Follow our guide to find out why your next best friend will be one of these fire breathing Dragonz. Dragonz takes its inspiration from How To Train Your Dragon, with a big open world filled with cute and colourful Dragonz that inhabit the reels. The bright 3D graphics of this fun video slot should appeal to all gamers. 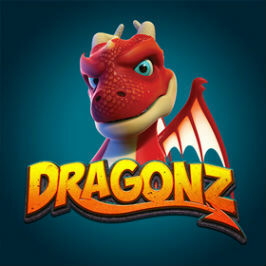 Dragonz is designed to be a simple and fun experience, with no story to divert you from the highly addictive gameplay. As the casino software is created by leading online video slot experts Microgaming, players can expect a high return-to-player (RTP) value of 96.3%. Dragonz is one of the few online video slots to utilise the 243-ways-to-win structure, so there are no fixed paylines. The 243-ways-to-win slot game play means that you can win simply by having three or more symbols on adjacent reels, without being connected by a line. As this can lead to multiple winning combinations on this slot game type with the same symbols, only the highest winning combination is awarded for each symbol combination. Although there are four Dragonz on the reel, most of the symbols are taken from classic slot games, with 9, 10, J, Q, K, and A used, each in a vivid, distinct colour. The 9, 10, and J all offer the same payout, with a maximum win of 45 times the initial wager for scoring five of them. The Q and K are also equal, with the highest award of 67.5x the bet. The red A is what you really want to aim for – it pays out 90 times the initial deposit. The Wild symbol can be substituted for all symbols except the Scatter. Any spin that doesn’t win but features a Wild on the central reels will see other Wilds appear to form a winning combination. 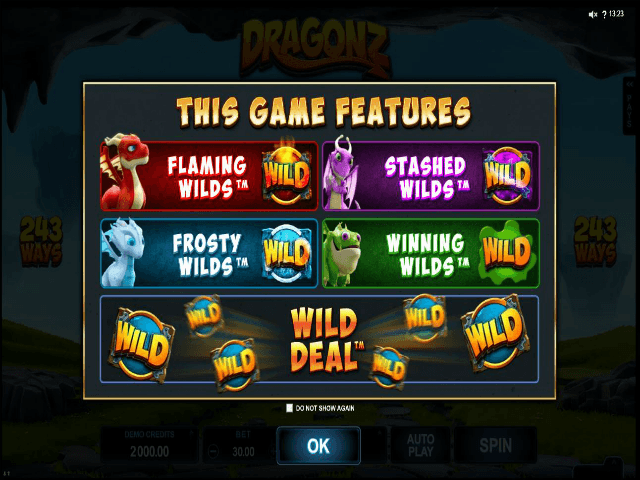 Free spins is the focus of the four titular Dragonz. You can unlock the individual power of each dragon by landing three or more of the purple Scatter symbol. 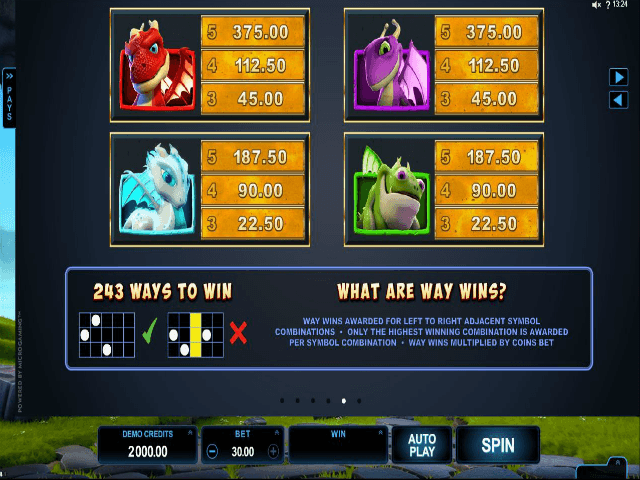 Doing this will trigger the Free Spins bonus, when one of the four dragons will be activated at random. If you land the Flint, the red dragon, he will shoot fire onto the reels, turning the symbols into Flaming Wilds. The more free spins you have, the more wilds he fires with every spin. Landing Switch, the pink dragon, will see her collect unused Wild symbols during the free spins bonus round. Once three or more have been stashed away, Switch will release them back to the reels to form a guaranteed win. The cute ice dragon Frost will trigger the Frosty Wilds, where he spits out ice and freezes non-winning wilds. They'll only thaw out if they’re part of a winning combination. The last dragon, the green one known as Gobble, activates the Winning Wilds. Gobble will belch out wilds onto the reels, and they’ll stay there until they win. If you like Dragonz - You'll like these slots too!